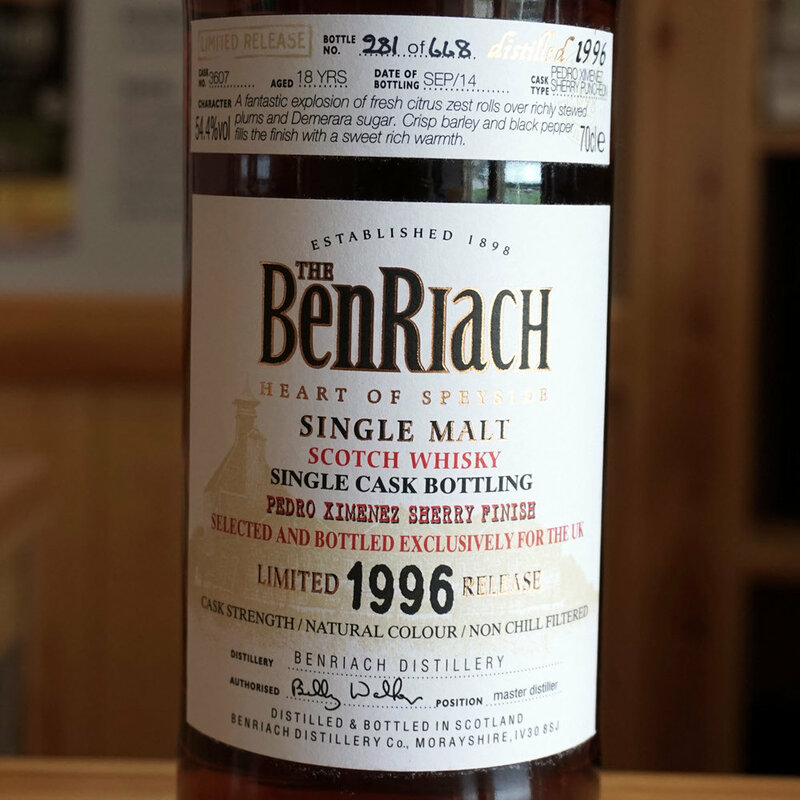 Here is a special treat that I tried at the BenRiach Distillery back in October 2014, the BenRiach 1996 18 YO PX Finish Cask #3607 UK Exclusive. This is a single cask limited release, UK Exclusive. Cask #3607 was a Pedro Ximenez (PX) sherry puncheon. The whisky was distilled in 1996 and bottled in September 2014. The total outturn was 668 bottles. Nose (22/25): Lots of PX sherry sweetness. The nose is really rich, heavy and oily. I get engine oil, citrus, mustard seeds, and Caribbean rum. Taste (22/25): Rich and creamy mouthfeel. Honey, chocolate, strawberries, and cracked black peppercorn. The PX sherry sweetness is very much at the forefront to taste, as it was on the nose. This dram feels so rich and thick you imagine you could cut it with a knife. Finish (22/25): Long and lingering finish. Orange marmalade on a slightly burnt toast. There is a mild bitterness to it. Balance (22/25): A very lovely dram, but very heavy on the sherry. If you are not into sherry bombs, then this is not for you. If you like sherried whiskies, then seek this one out.